The biggest sideshow in baseball is officially at spring training. Former Heisman Trophy winner and NFL quarterback Tim Tebow officially reported to camp with the New York Mets on Monday. Tebow is attending the team’s STEP camp, for its most promising prospects. 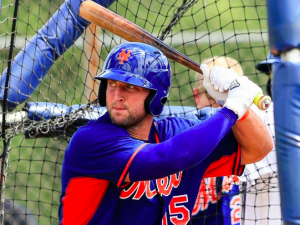 Day 1 of spring training was quite eventful for Tebow, who answered questions from reporters at a press conference in the morning and then proceeded to showcase his raw power during batting practice, hitting a total of nine home runs. Even since signing a minor league deal with the Mets last fall, Tebow has insisted that this is a legitimate attempt to reach the majors. Before choosing to focus on football and play at the University of Florida, Tebow was an all-state baseball player in high school. Tebow took part in instruction league with the Mets last fall, and then the team sent him to the Arizona Fall League, where he predictably struggled. Tebow knows there are many who doubt that he’s capable of reaching the majors, but he said Monday he’s not worried about that. Much like he exhibited throughout his football career, Tebow has no lack of confidence in himself when it comes to playing baseball. Tebow is also well aware of the challenge in front of him. But it will surprise no one to hear that he’s ready to meet it head on. The 29-year old quarterback spent part of his winter working out with Washington Nationals second baseman Daniel Murphy, a former Met and, like Tebow, a Jacksonville native. Tebow said he and Murphy became friends, describing him as also being “an addict for sports.” Meanwhile, Murphy, who hit an astounding .347 with Washington last year, has been impressed by Tebow’s baseball skills. After speaking with the media, Tebow showed off that “real” power by hitting nine home runs over four rounds of batting practice at the Mets spring training complex in St. Lucie, Florida. Of course, hitting home runs in batting practice is a little easier than getting hits during games. But if nothing else, Tebow showed up to spring training prepared and focused, despite the large contingent of media members and fans following his every move. What happens now with Tebow remains to be seen. It’s possible that the Mets will use him in big league games during spring training, which will certainly draw a crowd. Of course, his chances of being on New York’s opening day roster or even making it to the majors this season are just north of nil. The hope is that Tebow will perform well enough during spring training to warrant inclusion on a full-season A-ball club in the Mets farm system. But all of that depends on how well Tebow fares over the next month.